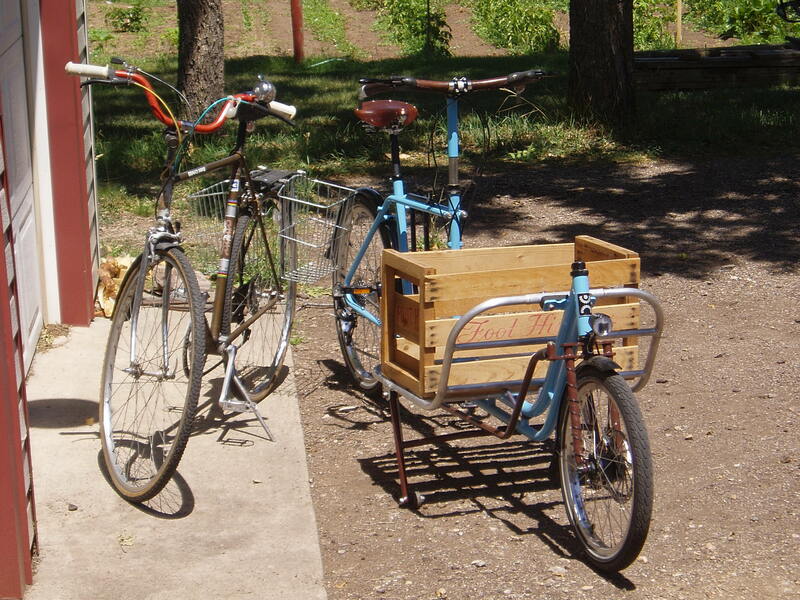 Here at Cycle Farm, we are very enthusiastic about bicycles as efficient farm tools. We’re using bicycles to help minimize our off-farm inputs. Employing bicycle- and human-power and minimizing our off-farm inputs is important to us for the following reasons.. Conventional agriculture has a huge environmental impact, from the use of pesticides, herbicides, chemical fertilizers, distributing produce to distant markets, use of heavy machinery, water use and pollution, etc. For us, reducing our inputs forces us to look at our overall ecological impact. For example, we are a human-powered, bicycle-driven operation. 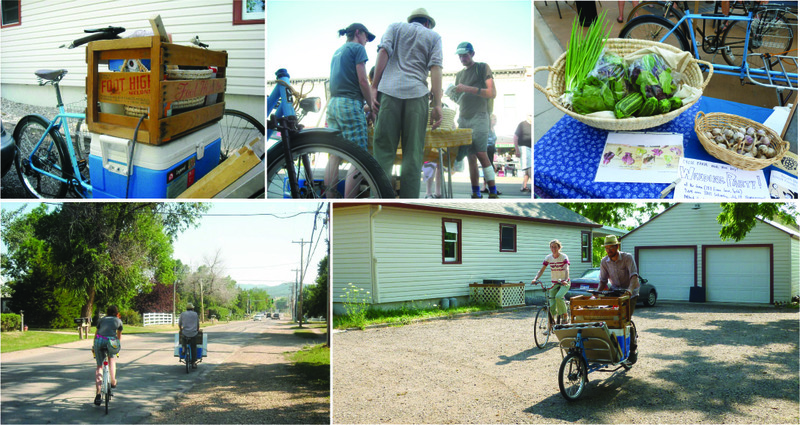 We take our vegetables to market each week by bicycle and encourage CSA members to ride their bike to the farm for pick-up. We are producing local food. Our goal is not to grow food for a large wholesale market, but to serve the community in which we live, Spearfish Valley. Additionally, we are not using a tractor, but instead all farm work is done by hand. This means we don’t have to use gasoline, which saves us money as well as reduces our carbon emissions. A second reason is economic; the more we can reduce the amount of things we have to purchase to run this farm, the more likely we can make a living wage off these three acres. A tractor, even a small one, is a considerable expense. If we can do the same work with our hands and with a bicycle, we can save ourselves and our market that additional cost. Beyond reducing gas use and our carbon emissions, we are working toward building soil carbon in our fields with small scale, no-till vegetable farming. Organic no-till methods are becoming more and more widespread in larger operations for a variety of reasons (soil conservation, carbon sequestration, nutrient cycling, etc.). However, this has not yet translated into small scale vegetable production, that we’ve found. We are experimenting with and developing methods applicable for a smaller scale (0-15 acre) organic, no-till operation (i.e. bike-powered roller-crimper). And of course, bicycles make everything more fun. By moving at a more human pace, we are getting to know our community better. We can stop and talk with friends and neighbors in passing. Hopping on a bike allows us to stay loose and flexible after long days in the field. And there is something so satisfying about hitting a pocket of cool air on a ride past Spearfish Creek on a warm summer evening. However, doing this alone ultimately may not accomplish much towards addressing pressing global crises. We are enthusiastic about helping to motivate our community and participating in an exchange of ideas on a broader scale. 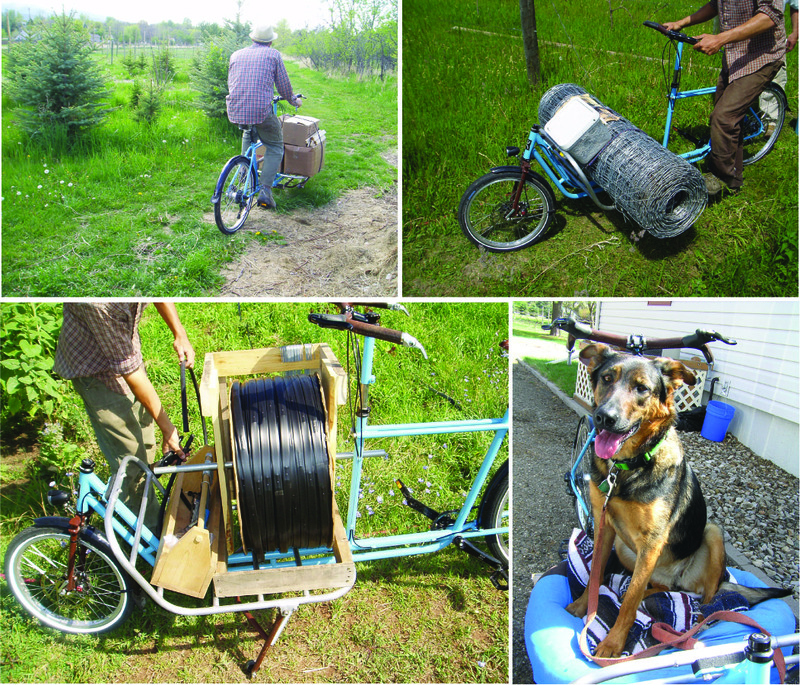 Interested in human-powered, sustainable agriculture? Come visit the farm, let’s talk! Lastly, when the farm slows down in the winter, we plan on gearing up a bicycle workshop in the garage. Building custom cargo and utilitarian bicycles and trailers, as well as doing frame repair.